I think we'll leave the serious analysis to the folks at the links. We were there. It wasn't exactly fun, but a bad day at the DBAP — no mistake about it, it was a bad day — is still a good day. And there won't be any more this year. Should we have been annoyed at the announcement that blared out just before the teams took the field? Durham Bull Dan Johnson named Tampa Bay Rays Minor League Player of the Year. Durham Bull Jeremy Hellickson named Tampa Bay Rays Minor League Pitcher of the Year. Durham Bull Elliot Johnson named Tampa Bay Rays Triple A Player of the year. What's that? Only three one of those guys was actually playing for the Durham Bulls last night. Really? OK, we know the whole point of AAA is to send guys to the majors, but sometimes, especially when you're in the process of getting your head handed to you, it hurts. So, why did it happen? It wuz the hats. I mean, have you ever seen an uglier hat? 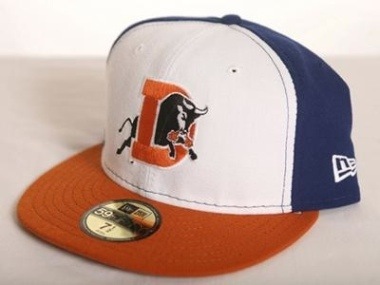 Can you imagine having to go out and play in front of discerning fans such as we have at the DBAP wearing that critter on your head? In the meantime, WDBB is working on a year-end summary, preparing for the Moonlight Graham Awards ceremony, and getting ready for another trip to the mountains tomorrow. One area needs your help. I'm pretty sure the Bulls front office reads our posts, so if you've got some DBAP gripes and praise, let me know and I'll pass them on. Let the blame fall squarely on the hats. Was tough knowing this was it til April. Overall I don't have much to rag on at the DBAP. The staff does a good job, it is a great place. The one gripe I do have is what they claim to sell as a "Bratwurst" I do not know what it is.... but it is not Bratwurst and it tastes rotten. Cook them on one of those gas grills you have hidden out by the Fowl pole. I know they will cost a bit more but people will pay for them. I'd bet the rent money on that. I like the hats. Sort of a 70s/80s throwback to the old Orioles hats. Before I criticize, let me say that for my money, they can have the "Kid vs. Wool E. base race" every inning and I would be happy. Those are classic! First off, Bulls staff is great! Never had a bad interaction with any of the--ever. Please, Bulls management, kill the "NC Green Team" concept. The video got old after the first couple of showings and by the end of the year I just felt embarrassed for the "members" (Jatovi and crew) who had to run out there like any fans actually cared. It was just silly, and not in an endearing way. If the debit card machines at the concessions aren't working, please have staff put up a sign of some sort to let us know that. This happened to me a couple of times during the season at the stand by the 3rd base seating entrance. And no, I'm not going to the nearby ATM to pay a couple extra bucks since it's not my bank's machine. Thanks for having Tony Gwynn in. I know the Bulls know this, but improve communication/planning on how early fans should arrive for this type of thing/where it will be held. I got there pretty early on and missed getting an autograph (OK it happens) but more importantly completely missed perhaps the best inning (10 runs!) of the year. Re hats: Anonymous helps make my case. :) Orioles!?? Buy Wool-E-Bull an enclosed racecar for next year. Most important part of last night was Neil indicating he has no other plans at the moment. I had sent an email during the 8th inning as he was going through the various players and their possibility of returning. No idea if that's why he mentioned it at the end of the broadcast or not. But I hope the Bulls appreciate the talent they have in the broadcast booth and compensate it properly. "This... is a simple game. You throw the ball. You hit the ball. You catch the ball." My row was blaming the loss on the "Champagne Curse" - we think they celebrated with champagne too early when they uncorked those bottles at the end of the Louisville series! Great season though; we loved every game we came to and can't wait for April!! Suggestions for next year...bring back the previous mexican and pizza vendors...their food was much better. YES Please destroy that Green Team video. Could we also ditch the opening "fan rules" announcement by the Susan Sarandon wannabe with the fake deep south accent. Talk about an embarrassment. - The team was wonderful this year. We got spoiled rotten watching them. I'm sorry we didn't take the Govenor's Cup and the Nationals back-to-back, but the guys have every right to be proud. It was a wonderful year for baseball @ the DBAP this year. - The Bulls staff is wonderful - responsive, respectful, and all-in-all a great experience for the fans. - Speaking of fans... the fans that have been installed under the roof are marvelous. This was the most comfortable we've ever been in the stands. - The field looked great this year, too - the best we've ever seen it. Great job, Scott! - And I echo the earlier comment about Neil Solondz. He's top notch. - Bring back Dominos. Nobody I spoke with liked the pizza this year. It even looked unappealing. - Ditch the Green Team video. Also, some sound in the background of future videos that doesn't sound like feral cats being skinned alive would be nice. - It might even be a good idea to have a couple of videos planned rather than just one all year long. Last year I got sick of the cockroaches. A little variety might make these more tolerable... less to dread. - We'll miss X. He's been great. - I'm sorry to know that Elliot Johnson is a free agent now, as it makes it less likely we'll see him next year. It's been wonderful to see him develop. - Rumor has it that Joe Dillon is likely to retire. I really like Joe. He's had some tough breaks this year, but has a lot of chutzpah. Anyone who crawls home with a torn-up hamstring has got my undying respect. - Finally, when it comes to the Diamond Club... I'd like to see some more variety next year. I'm inordinately proud of our guys for being the 2009 national champs, but I don't need umpty-two hats that are identical except for a bit of advertising on the back. But even though I have a few suggestions, I'm still coming back next year - no better bang for my buck. A great place to be, great games to see. 10-4 on the pizza and the green team; they both stunk. Ditch them. Agree that we have been spoiled; we've had season tickets for six years, and were regulars for 3 years b/4 that. with the exception of one year, the team has been terrific. Agree that the staff is also terrific. Thank you Jon and Mike for those fans; we were not uncomfortable in the stands this year, as we were sometimes in past years. One small suggestion: bring back Hebrew Nationals, don't care much for Sabretts. Looks like it's going to be a far different team next year: Chris, have you heard any scuttlebut whether Charlie's coming back? Are the softball games next week worth watching? Since we're hoping that the Bulls' office is reading this, I'll take the opportunity to say how great the broadcast arrangement was this year. I can't make it to the park every week, so I rely on the broadcasts to stay connected to the Bulls. As a couple people have mentioned, Neil Solondz is first rate. And I receive 620 AM well all the time--no games on weak stations or on internet only. Fantastic! And (not having cable) watching on digital channel 50.2 over the air is really great, too. Thanks to the players, the management, and to WDBB who each had a great season in their own ways. Many thanks to Chris for your great coverage this season! If I have one it's that darn "Bugs in the Bucket" thing for the kids. It seems that the smaller the kid the farther away the 3rd bucket goes. I mean why not put the 3rd bucket in the visitor's bull pen?? Give the kids a chance! We lost because they can hit and we couldn't pitch. I see that the Clippers kept on their roll by beating the Tacoma Raniers 12-6. I know there are deep philosophical discussions to be had regarding momentum and baseball, but clearly September was the Clippers' month. As soon as I get a few things sorted out I'll put on my comments regarding the DBAP and move on to some post-season observations. Am I becoming a Rays fan if it turns out that I care that they are in first place today? Most people say that it is better to customize baseball hats in a real store so you could get the picture of it. Is that true?